The philosopher Hannah Arendt said that the essence of being human is participating in moral discourse with others. "The things of the world become human for us only when we can discuss them with our fellows. We humanize what is going on in the world and in ourselves only by speaking of it, and in the course of speaking of it we learn to be human." 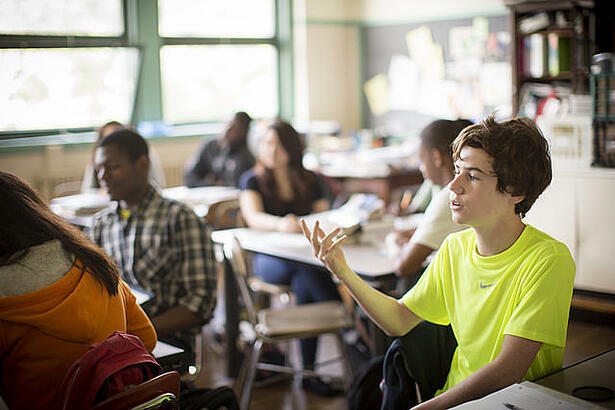 In a reflective classroom community, students work together in an engaging study of our past, and of our world today. Knowledge is constructed, not passively absorbed. And students, with both hearts and minds mobilized, are seen as subjects actively engaged in a community of learners. A trusting classroom atmosphere like this creates the space for deep, democratic learning. The creation of an environment like this requires a thoughtful approach. Below are eight practices that are components of a reflective classroom. They are not listed hierarchically, and this is not an exclusive list. This must permeate every aspect of a classroom, and is embedded in all of the other components. It includes a deep respect for both the students and for the subject matter. Can students take risks? Will they be "shot down" or ridiculed by other students, or even by the teacher, for openly sharing their thoughts? How will the teacher handle it when one student personally insults or belittles another student? Will students be respected and honored as thoughtful participants in a community of learners? A teacher's behavior in these situations sets the tone for the whole class. We need to be explicit and put into practice our belief that a deep respect for each student is at the heart of our educational endeavor. How we arrange our rooms makes a statement and sends a message to our students. Some arrangements promote a reflective community better than others. When a whole class discussion is going on, it is easier to talk to each other when participants can see the faces of fellow students. Arranging the furniture in a circle promotes a sense of community and can make a difference. Likewise, arranging chairs and desks in clusters for small group work facilitates discussion. And then there's the wall space. Relevant pictures, posters, and student work can play a role in generating a thoughtful atmosphere. Perhaps more important than anything else, questions promote active learning. When the teacher and the students are involved together in a dialogue, they are engaged in a process of ever-deepening consciousness. A healthy questioning of causes, motives, and underlying assumptions and values can only enrich student learning and foster a deeper understanding. Silence is one of the most powerful and underused tools in the classroom. Whether it is used when a teacher slows down his or her speech to emphasize a point, or after asking a question, or even after a student has responded to a question, silence can be invaluable. It creates space for thought and sends students the message that we trust them as thoughtful learners who need time to reflect. When students can connect what they are studying with their own lives, it sparks within them a deeper interest. They see the relevance and realize that this kind of learning can enlighten and enrich them personally. They want to learn more. Instead of asking young people to discuss events from the past, we can connect historical case studies to the moral questions they face in their own lives. Engaging students in this way enables them to see the way that the choices people make shape history. They also can reflect on how to make a difference. For example, looking at the role of a bystander in a historical case study leads to deeper engagement with the past, while at the same time allowing students to reflect on how they themselves would respond when they see an injustice occurring in their own communities. With these kinds of issues at stake, students are often eager to build and participate in a reflective, trusting classroom community and learn from each other. Sculpture, music, poetry, artwork, dance, short stories, video productions, and other forms of expression can all demonstrate student learning and can deepen and enrich understanding of content. Providing different kinds of opportunities for students to express learning creates a classroom environment where a variety of student gifts are appreciated and celebrated. Issues are sometimes introduced in class that can lead to highly-charged, differing, and even opposing viewpoints. Teachers need to have both the courage to raise these issues and the wisdom and skill to manage them. Some teachers are concerned about raising controversial issues, afraid that a class discussion on such issues might be upsetting, get out of hand, be unmanageable, and cause hostility between students. This does not have to be the case. Learning to voice your own thinking on an issue and listening to those you disagree with is a cornerstone of a well-functioning democracy. When students are able to have a conversation that involves communicating their own views and listening to diverse viewpoints, their thinking is both enlarged and enriched. Being challenged in this way helps them to mature and develop as thoughtful, active citizens. They have begun to create space for the other and, in the process, have deepened their own thinking. In a classroom that has been practicing these eight components, this kind of deep, democratic learning is possible. These eight components are just a few of the many possible ways a community of learners might take shape. What is important is that teachers have the opportunity to step back and reflect together with colleagues on how they want to create these thoughtful classrooms. These kinds of classrooms don't just happen overnight. Teachers and students are always growing and developing the art of creating a community of learners. Numerous decisions are being made every day. Mistakes will be made. But the more teachers take time to look at the components of a reflective classroom and consciously work at creating a thoughtful environment, the more effective they will be. Find out how Facing History's professional development and support can help you build a reflective classroom. How do you create a reflective classroom? Comment below. Explore how Facing History's educator resources can help you build a reflective classroom. How do you create a reflective classroom? Comment below. Doc Miller has been an educator for over 45 years. For 36 years he was in the classroom, teaching social studies in New York City, Boston, and Concord, Massachusetts. Doc also worked with Research for Better Teaching for 10 years, and has taught in Europe, Latin America, and the Middle East. He has worked with Facing History for over 30 years.